Everyone came together and spent the day freeing them. 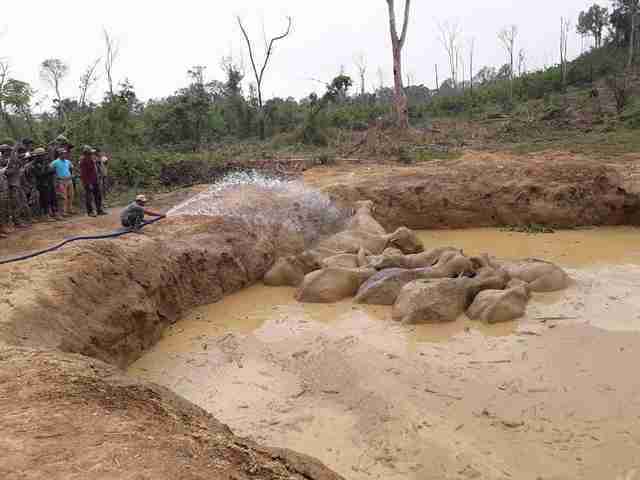 A crater left by a U.S. bomb during the Vietnam War, decades ago in Cambodia, nearly claimed the lives of a whole family of elephants this week. 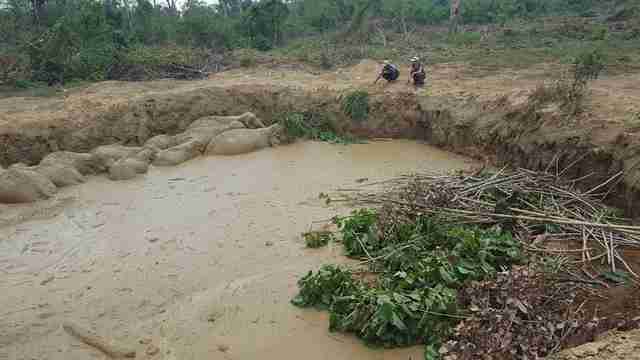 The crater - which has recently been used to store water by local farmers - lies in Keo Seima Wildlife Sanctuary. 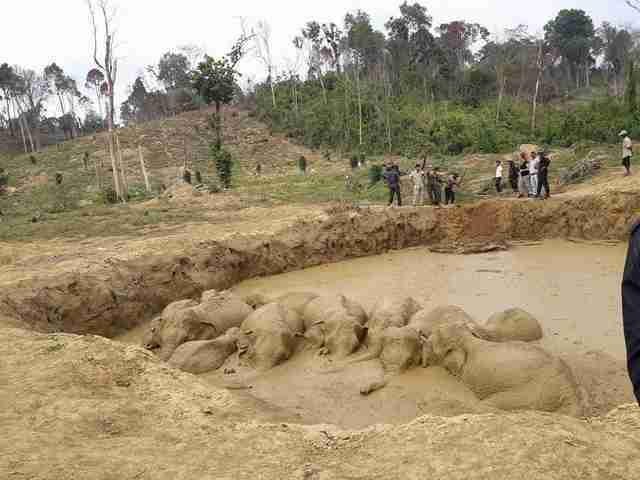 When farmers discovered 11 elephants stuck in the crater, which had become full of sticky mud, the animals were struggling desperately to get out. The farmers rushed to tell the local Department of Environment about the family in need. 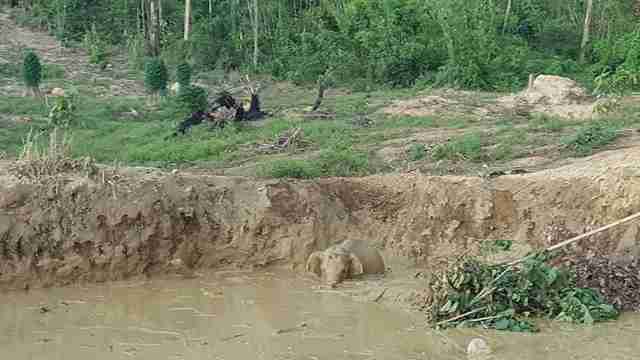 When rescuers arrived from Elephant Livelihood Initiative Environment (ELIE), run by the Elephant Valley Project, and Wildlife Conservation Society (WCS) Cambodia, the whole family was obviously exhausted from trying to climb out of the mud pit. People offered the three adult elephants and their eight children some food to help them feel safe and also to help them regain their strength. "They were so hungry, they munched it down and it gave them some energy," Jemma Bullock, program manager for ELIE, said. 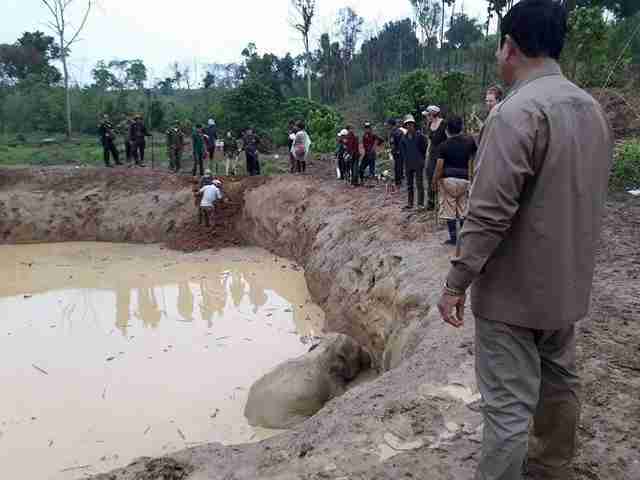 Rescuers brought a hose over to the hole to loosen the thick mud and make it easier for the animals to move their limbs. The fresh water also helped the elephants cool down, since they'd been stuck there while the hot midday sun was beating down. 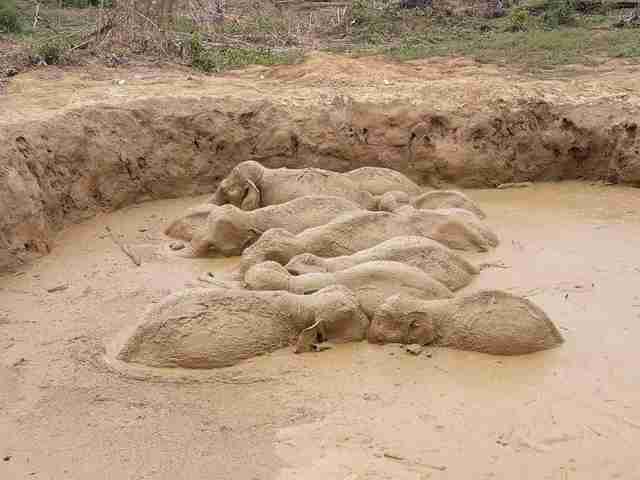 People dug ramps into the pit that the elephants would be able to use to climb out safely. Finally, the mother elephant, who was the leader of the herd, moved toward the exit, and the elephants started to climb out. 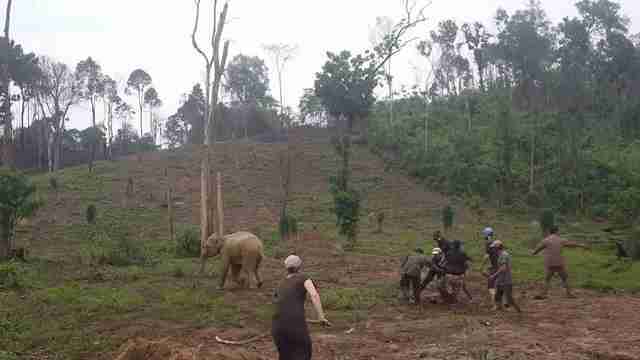 The crowd of locals who had gathered cheered for the family as the first few elephants got free and ran toward the woods. But the struggle wasn't over yet. As storm clouds gathered overhead, rescuers realized that one of the babies was still stuck. The baby's little legs weren't big or strong enough for her to climb up the ramp by herself. 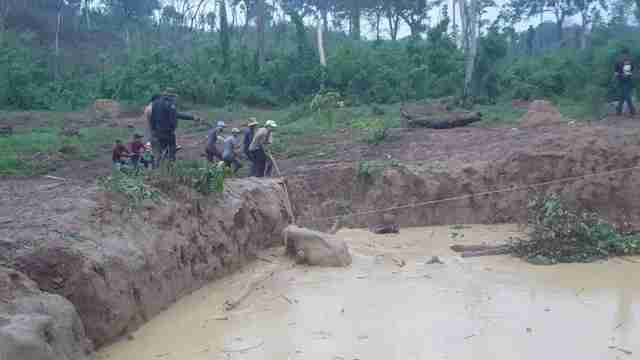 A rainstorm broke out and the rescue team tried using rope to help boost the baby out of the pit. At one point, she was so scared and tired, rescuers had to encourage her with sugarcane and bananas. And finally the little baby also ran free. 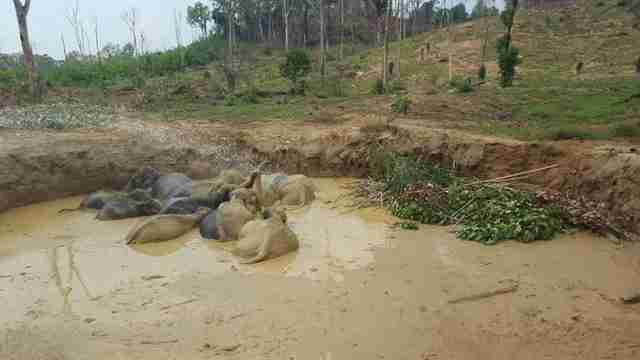 "If the community had not got together with the WCS, ELIE and the Department of Environment to rescue these 11 Asian elephants, this would have been a tragedy," Tan Setha, WCS technical advisor to the area, said. "This herd consisted of three adult females and eight juveniles of various ages, including a male that had almost reached maturity. 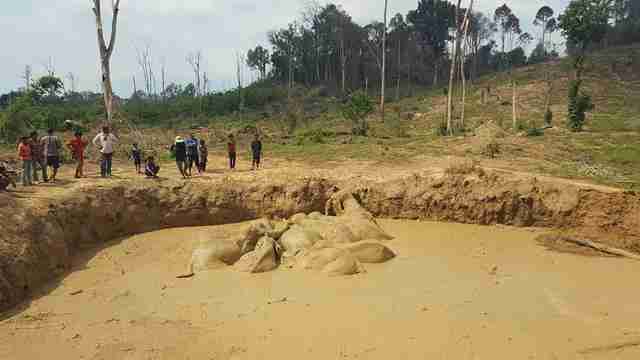 These elephants represent an important part of the breeding population in Keo Seima Wildlife Sanctuary, and their loss would have been a major blow for conservation." Because of habitat loss, there are only about 35,000 Asian elephants left in the wild, so every individual life matters not only to the tightly knit herds, but to the future survival of the species. "[The rescue] highlights unfortunately the ugly side of deforestation and the effect on wild animals," Bullock told The Dodo, "but also the resilience of the community." "This is a great example of everyone working together in Cambodia to save wildlife," Ross Sinclair, WCS country director, added. "Too often the stories around conservation are about conflict and failure, but this is one about cooperation and success." To give elephants the happy endings they deserve, you can make a donation to the Elephant Valley Project.